When is the exact start date? Planting and harvest dates are affected by the weather, so we will contact all members as we approach June to confirm the exact date of the first pick up. But you can plan for the 1st week to commence on June 13th. Will the selection be different each week? Our crop plan is designed to ensure a diverse range of vegetables from week to week. 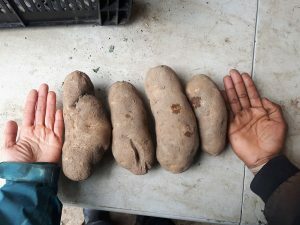 However, because everything is seasonal and grown on the farm, there may be a few staple items repeated each week when it is peak season for certain crops. For each pick-up we strive to include a mix of root crops, leafy greens, and fruiting crops! What if I cannot make the pick up one week? We understand life happens. We encourage members to send a friend to pick up for you! Otherwise, please let us know in advance if possible and we will bag and store your share in our walk-in cooler. You have until Saturday 2pm to come get it. After that time, any left over shares will be donated to a local food bank. We can also arrange “doubling up” on another week, if you let us know in advance. Do you buy in produce from other farms? All produce in the harvest share is grown on the farm. The only exception is if there is a major crop loss due to weather, pests or disease. Should this need arise, only organic produce will be purchased in, and the specific vegetable and its source will be clearly indicated with signage during the weekly pick up.